Compare Ninja is an innovative web application for easy building of comparison tables, managing statistics, and easy integrating your results into websites. From the moment you start using Compare Ninja, you will see that it provides simple to use interface, fast and intuitive controls for creating and editing tables, easy to implement embedding options and social features that will spread the world of your project to thousands and millions of people with simple click of your mouse. If you don’t want to create brand new tables in Compare Ninja editor, you are free to use import option that will accept CSV files and convert them into great looking HTML5 tables. Compare Ninja allow you to simply create and manage beautiful HTML & CSS comparison tables without any prior knowledge. Compare Ninja has a unique intuitive set of online tools with friendly user interface that allow anyone to create HTML & CSS tables on the fly. 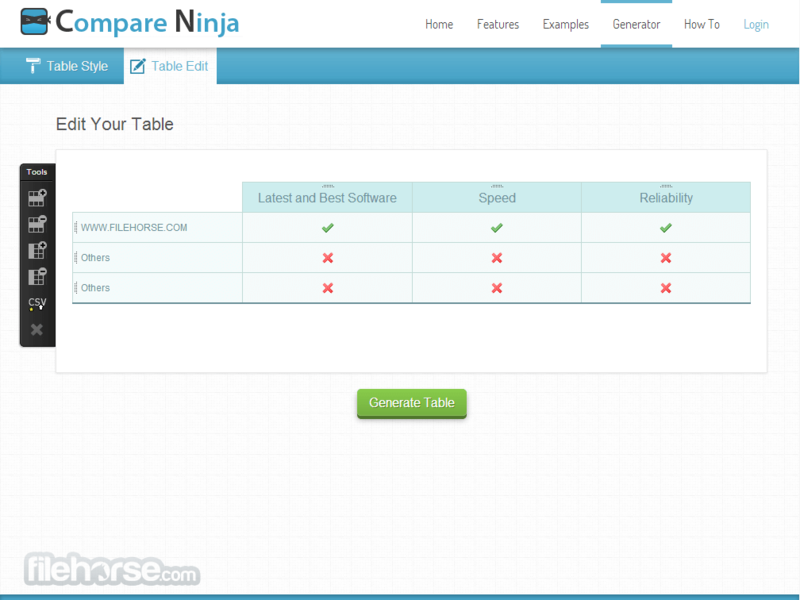 It's easy to implement Compare Ninja's comparison tables on any kind of website you own. Just copy and paste a single line of code! After creating a comparison table Compare Ninja encurage you to share your creation via Facebook, Twitter and other social networks. Compare Ninja allow you to simply create beautiful HTML & CSS comparison tables on-the-fly without any prior knowledge. Compare Ninja uses intuitive and innovative user interfaces such as Drag & Drop, Inline Editing, Image Upload and more - what makes the task of creating HTML & CSS tables much easier! Browse between dozens of beautiful HTML & CSS table skins that were customized to Compare Ninja tables and choose want suits best for your website. One of the greatest things about Compare Ninja is that after you've done editing your table, you can easily publish it by just drop a few lines of code into your website or blog without having any prior knowledge in HTML & CSS. Once you've paste the relevant code inside your website you can forget about it and just keep editing your table here at Compare Ninja while we will automaticly update the table in your website! Publish a table by copy and paste 2 lines of HTML code into your website once per table. Then view, edit and delete your comparison table throught Compare Ninja's user Dashboard. Add rows, columns, images and texts without changing even one line of code! Get statistics about your tables views in the Compare Ninja network. Analyze your tables content and find out which of your tables is the most popular. 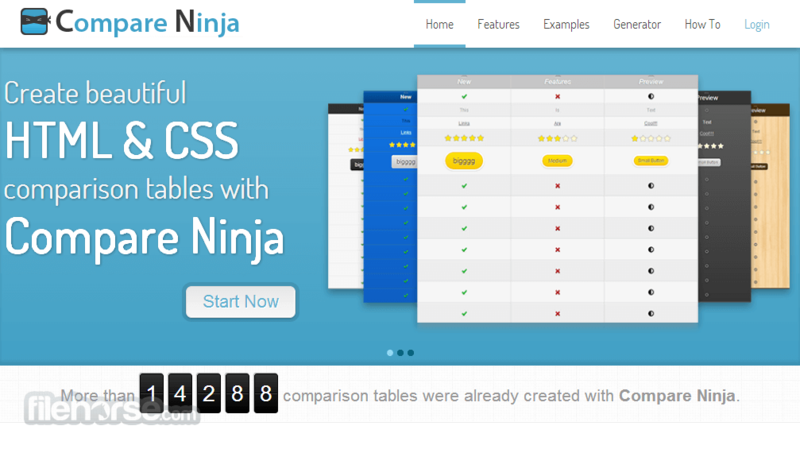 Compare Ninja allow you to import CSV files and convert them into a valid HTML & CSS tables. After importing the CSV file, you'll be able to edit the table in Compare Ninja's labs. Share the comparison table you have just created with your Facebook, Twitter and other social network friends with the Compare Ninja social network buttons. Experiencing an issue? Having a question? Don't know where to start? Try now our brand new "How To?" tutorials page or contact Compare Ninja's development team. Over 10,000 Comparison Tables! Get inspired with more than 10,000 beautiful comparison tables around the web that created with Compare Ninja. 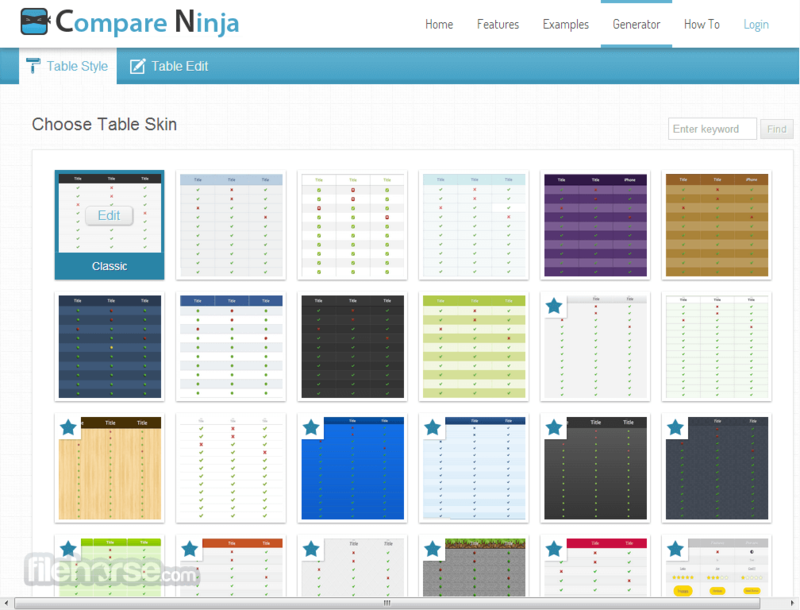 Compare Ninja allow you to simply create and manage beautiful HTML & CSS comparison tables without any prior knowledge. Compare Ninja has a unique intuitive set of online tools with friendly user interface that allow anyone to create HTML & CSS tables on the fly. 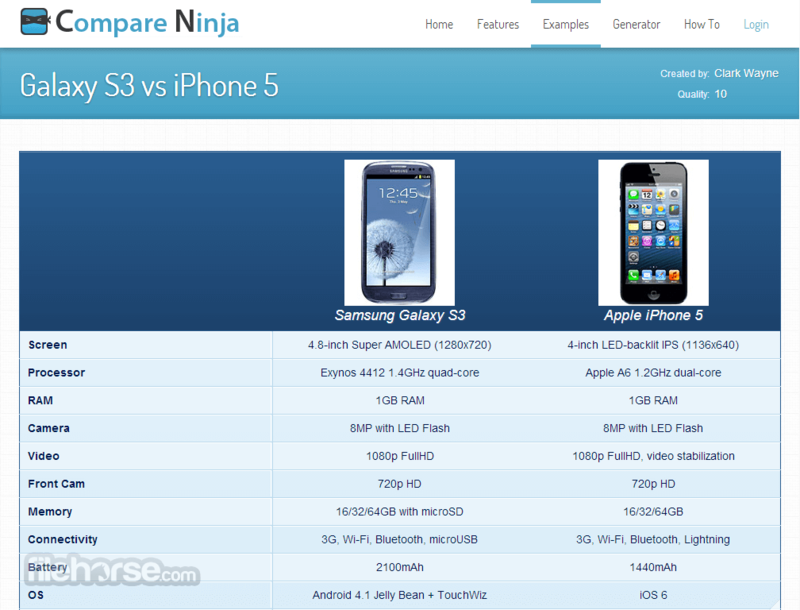 It's easy to implement Compare Ninja's comparison tables on any kind of website you own. Just copy and paste a single line of code! After creating a comparison table Compare Ninja encurage you to share your creation via Facebook, Twitter and other social networks.